At the outset I extend my heartfelt warm regards and wishes to all of you for Chartered Accountant's day. It was on 1st July 1949 that The Institute of Chartered Accountants of India got established and noble profession of accountancy was adopted by the constitution of India. I also take the opportunity to wish you a Happy GST Day. I feel extremely privileged to take over as the Chairman of this esteemed Anand Branch of WIRC of ICAI. It is undoubtedly a great honour for me to be blessed with such an opportunity to serve you. I also extend my sincere thanks to all my Colleagues in managing committee for electing me as the Chairman of this branch I am also grateful for the confidence you have shown in me by electing me the member of the managing committee. I am also delighted to inform you that today is a special day for us as we are celebrating this special day with inaugurating our renovated branch premises. Friends I feel really excited on this special day because this Team Anand has got the opportunity to work something for this branch. Friends, it has been a very fascinating journey since last 18 days. We have come across many ups and down during last 18 days. But today I am happy to see that the efforts of the Team Anand has been succeeded. I am extremely happy to announce that members of the Anand Branch has helped us generously for the renovation of the branch. Due to help and support of members and well wishers we have completed this work in very short span of time. Friends, every good work is the combination of good people and all the good people of Anand Branch has come together for this Noble Cause. I am really thankful to past chairmen of Anand Branch, members and committee of Anand Branch for supporting in this noble cause. We believe in the following three important points for completion of Renovation of Our Branch. We will certainly make efforts to address the requirements of the students, Members in Employment and Practice for their growth and development. Moreover, I assure you that our branch will keep organizing various programs like seminars, orientation programmes, information technology training, general management and communication skills, sports events, meant for its members and students. Friend the this is being the year of change, a year of transformation and let me tell you this is very important and challenging for the profession looking to the new opportunities like Goods & Service Tax (GST), Real Estate Regulation & Development Act, 2016 (RERA), and various new compliances under the existing Laws. Looking to these challenges and opportunities various programs are organized by Anand Branch for the benefit of Members and Students. 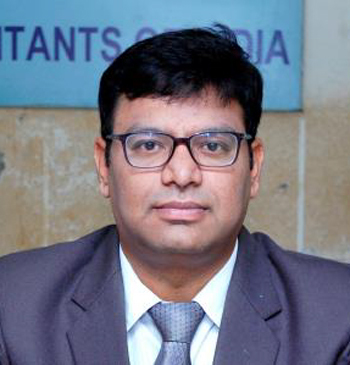 In the emerging scenario of business world, where more and more new legislations are coming which involves a lot of compliance and reporting our responsibility as Auditors and Certifiers is increasing manifold, which calls for discharge of our responsibilities in a diligent and ethical manner. In order to keep ourselves abreast of the latest developments we have to constantly study and update our knowledge. Our branch is planning for a series of knowledge enrichment programmes on new emerging Laws and compliances like ICDS, Ind AS and GST. The GST GYANSETU - 2017 series has received tremendous response from the members and students at large. The history has been created for Anand Branch having more than 135 registrations in the Branch Premises. I am also thankful to all the participants for making the event successful and memorable. Our branch has received recognitions from the WIRC for the last many years. This, in itself, is evidence that the Branch has been successful in achievements of its intended goals. It shall be our unfailing endeavour to continue the same momentum, nevertheless, the flair of innovation and creativity shall be added so as to add to the quality aspects and intrinsic value of the programmes being conducted so as to achieve maximum participation from our fraternity representing practice, industry or business. I request you all to attend all these branch activities and seminars at large. Any kind of support and cooperation from the students and members for the benefit of CA fraternity would be highly appreciated. Also, feel free to provide me feedback and suggestions at my mobile no or email address mentioned below as it will help to enhance our performance. I am inclined to conclude the first ever communication from my desk as the Chairman, by famous quote of Walt Disney "IF YOU CAN DREAM IT YOU CAN DO IT". I also hope that the members of the great institution can reach newer heights, contributing to the noble act of NATION BUILDING.